Local street artist fnnch has plunged the former T-Mobile store at 20th and Mission under the sea. 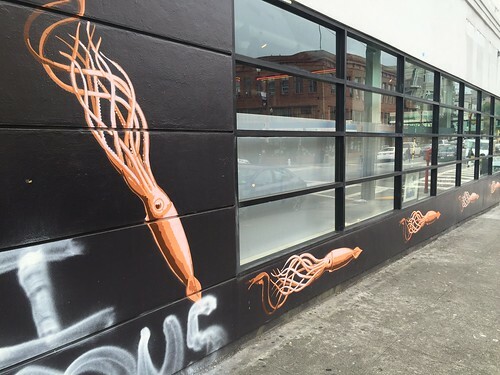 The 20th Street side of the building is now covered in a series of orange squid, with the Mission side getting a spattering of yellow starfish. If the starfish look familiar, you’ve probably been by Ritual recently, where two similar starfish can bee seen on the sidewalk by the nautically-themed parklet. Of course all of these homages to the sea are a little out of place in the Mission, since the actual sea is only a couple neighborhoods away in almost any direction. You are currently browsing the MrEricSir.com blog archives for March, 2016.